OMG I actually cooked on my own! Well if you know me outside of this blog you know that I don’t cook. I have fears of knives, fire and hot popping oil. Baking is much more my style (with a box of mix 😉 ). So as I try to save money and stop eating fast food all the time, I’ve been experimenting in the kitchen and actually cooking. Last night was the first night I experimented on my own WITHOUT a recipe! 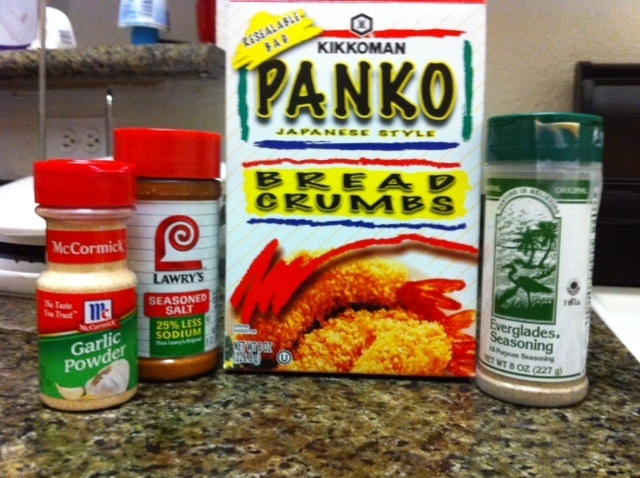 I had recently heard of panko bread crumbs and really wanted to try them out. So I picked some up on my recent shopping trip. I had chicken in the freezer (I seriously had to ask in a facebook status how long chicken can be in freezer for, I’m def an amateur in the kitchen). I decided to try baking the half of the chicken and cooking the other half in oil on the stove. The panko box recommends adding flavoring, so I included my 3 favorite things: garlic powder, lawry’s seasoned salt (i put this on almost EVERYTHING), and everglades seasoning (which is the best thing to come out of Florida, other than me of course). I put all that stuff on a plate, cut up the chicken, mixed two eggs and lil bit of milk in a bowl and went to work. I dipped the chicken in the egg/milk mixture, then coated them with the panko breadcrumb/seasoning mixture. I took 3 pieces of the same size and put them in the oven. I took all the odd shaped chicken pieces and cooked them on the stove in a pan with a lil bit of EVOO. I would of taken pictures of the process but my hands were covered in raw chicken juice, panko bread crumbs and eggs. Not really conducive to take photos with an iphone. Adding to my kitchen stress of cooking with hot oil popping everywhere, I planned on eating the chicken over pasta with alfredo sauce. So I had two things cooking on the stove and one in the oven. I managed to get burned three times, one was almost really bad. I was going to look into the oven to check on the chicken, when the hot oil on the stove popped and hit me on the upper arm. OUCHHHHH! Luckily it wasn’t my face though, gotta protect the money maker. After that I was using various utensils and potholders to cover my face will working around the oil. 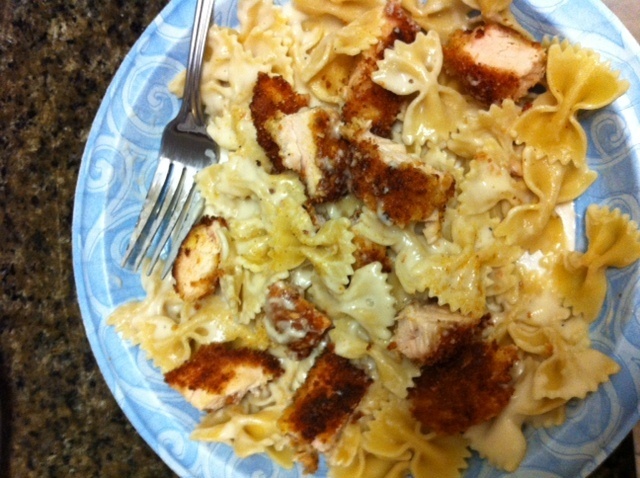 The chicken was seasoned perfectly, the panko breadcrumbs had a nice crunch, and I was super impressed with my skills! I wish I had more pictures to share, but I was too busy cooking to take them. Now if only I had someone to wash the dishes for me, life would be perfect. I seriously hate washing dishes (or cleaning at all) so that’s the one downfall to cooking. The meal made the cleaning worth it though. I also have plenty of chicken to last for a couple more days this week, SCORE! What new things have you cooked recently? What are your fears in the kitchen? This looks delicious! I’ve seen those bread crumbs in the grocery store before, but never thought of trying them! they’re really good! you should definitely try them! i think i’m going to try different seasonings next time to mix it up a lil bit.